There can be only one return; 0 RLY? My opinions and choices on style of coding evolves and changes over time. By blogging about this now, I can refer back later when I change my mind. I can also elicit the opinions of others to influence me to change my ways if I happen to be wrong and not know it yet. Lets talk about returns. There is an opinion that methods should only have a single return. This gives them a precise flow of control, and forces you to essentially either process data through a few processes and return the final result (which can be very functional) or store a result variable and correctly populate it within control flow logic ('if'/'else', 'switch', 'while' commands, for instance). If you don't actually return a result, you can still think about flow of control and where you exit from. The first one seems self explainatory, but I will come back to that one soon. Lets discuss 'WhenIUseAResultVar'. I have a method with a very awkward control flow. But here is the catch: This control flow actually is enforced (in C#) by the compiler that result must be initialised. My method could decalare at the start that 'result' is initialised to 'null', telling me that a null could be returned if all logic falls through. In this case I have gone for the opposite, which means the compile ensures that all my cases through my control flow logic will set the value of result. for building and modifying this kind of method is like a free unit test. This code actually will not compile. It has compiler error CS0165 Use of unassigned local variable 'result. For me, this is gold. It might look better to you for now, but stick with me. I will refer back to this in a moment. Why I break my own rules. I don't usually break this rule. But when I do, I do so strictly and with intent. There is a time and a place to exit early, and it is preconditions and validations. throwing OutOfRangeException ArgumentNullException ArgumentException and other preconditions make sense to exit early. // Technically, this is already an early return. Hmmm... turns out this is a poor example and I can't actually acheive it with exceptions. For arguments sake, lets use 'null' as failed, rather than throwing. I may even use the single line format above without the braces on my returns, to further distinguish them for critical method logic. Even when you have a 'void' method, the method still returns. Remember DoSomething from above? Let's do something similar to above and strictly apply a single point of return (i.e. the end of the method). Is this an improvement over alternatives? Not really in my opinion. (Remember I said this was my all about my opinions?) I actually felt worse and worse as I typed out each successive example. (I think I am trying to extract out intent by the above refactorings, but by this point I can't be sure). I'm liking this. Get validation out of the way, get on with main logic control flow. 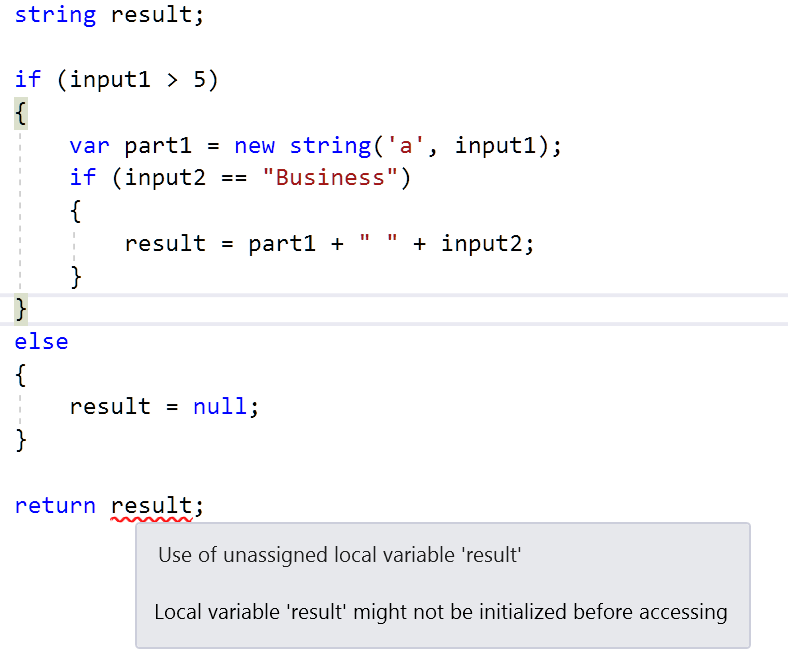 If my method actually returns Errors as a use case, I opt for something like I do with my Beefeater library and have Result<TValue,TError> response objects, and control flow rule (and early-return-for-validation exception-to-sed-rule) applies again. I've written these on the assumption that you do not want to evaluate more conditions than you need to. This aids readability, but is functionally different to the first example. Even if isLargeCase is true, we still evaluate and execute isSmallCase. In the original example, isLargeCase being true shortcircuits and stops the evaluation of isSmallCase entirely. If this was a real example, and isSmallCase required extra database access or web calls, you probably don't want to always evaluate this up front. I'm not even sure if I have actually convinced myself 100% at this point. Reality is, I have all of these techniques in my tool box, and I will probably pick and choose to enhance readability where applicable. Pragratism usually wins in these matters, but I find it useful to stop and think about concepts like this from time to time. I was originally prompted to write this after reading the lecterror blog article Code formatting and readability and related StackOverflow question Should I return from a function early or use an if statement?.